A coffee made using the AeroPress is best described as somewhere between a French Press and V60 Pour Over coffee. Coffee is filtered under pressure like a French Press, but the filter is paper like a V60. This combination results is a clean, full bodied, great cup of coffee. Liquid Black offers complimentary AeroPress paper filters with every bag of our Filter Roast coffee beans, so you'll never need to buy filters or worry about running out of them. 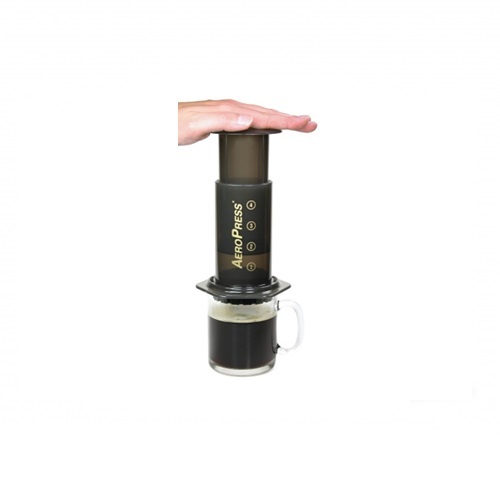 Also, added bonus is making coffee using the AeroPress it a mini gym workout, as you're creating the pressure. If the mini gym workout doesn't sound like your "cup of coffee (no tea here)," then you may prefer to make filter coffee using the V60 Pour Over method. Note: Does not include the hand, glass, water or coffee. Price includes GST and delivery.